Stomach flu, stomach bug, food poisoning... sometimes it's hard to tell, but we all know the signs. Diarrhea, nausea and/or vomiting, and sometimes, reflux laryngitis! 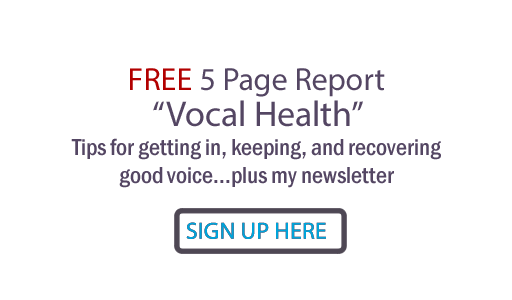 Yours truly just had the experience (I'm always doing research for you:) After a 24 hour bought with something intestines decided didn't belong there, I noticed I had developed laryngitis... and hadn't been singing or speaking, other than to moan! ...inflammation of the voice box (larynx) caused by stomach acid backing up into the esophagus. Hello again, Judy! It's Sam Bieber, I contacted you a while back due to some vocal issues but it turns out I had mold growing in my room which was causing a ton of health problems! I'm finally starting to get better now that it's taken care of. I've been singing again and my soft palate is kind of raising but not enough. Also, my tonsils start to fold in and get in the way and those two together are hurting my tone, as I ascend especially. I was wondering if you had any helpful exercises to help with this stuff. Thanks!! Sam we'd really need to work this out in a lesson. There may be a subtle posture or pushing issue; wouldn't know unless I saw you. Glad you got to the bottom of the mold issue- wow, you must be feeling better! Great information, thanks for the link, David! Thanks for sharing this extremely informative information on acid reflux. I recently read about acid reflux or silent reflux on website called medcline.com. I found it extremely helpful.